Our youngest nephew celebrated his first birthday a month ago. In late September I was finally transitioning from Summer to an Autumn frame of mind, and found myself imagining bibs and shirts for boys with Halloween, Thanksgiving and football themes. In an effort to use up blanks from my stash, I chose these applique designs to stitch on terrycloth bibs from Babies R Us. 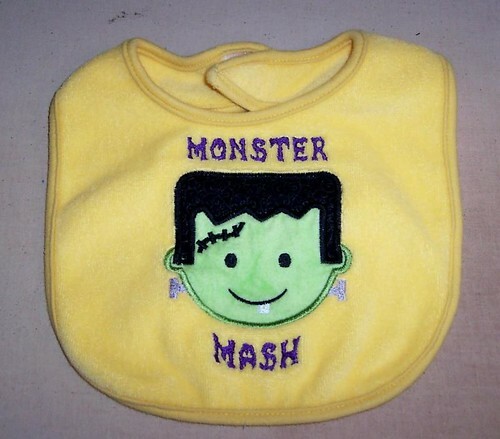 I still have a few of these blank bibs left in odd colors. The football design is an applique I've had for a few years; I think I bought it at Embroidery.com, but can't remember the designer. I stitched this design for one of my other nephews about 3 years ago and blogged it for Thanksgiving 2007. All of the other applique designs in this post are from Planet Applique. The Frankenstein monster design needed something extra, so I added the text with 4D Embroidery. The acorn is a freebie design. I had a little trouble embroidering the puppy on the chenille, mainly because I didn't secure the water soluble topper well enough. I fixed that for the other two, but then I mixed up the orange and yellow sections on the candy corn. The orange was supposed to go in the middle ... oh well. After finishing up the bibs, I thought I'd make matching shirts for both RJ and his big brother, Ryan. I found some blank thermal knit shirts at Kohls in boys' and toddler sizes. They were having a BOGO sale at the time, so I picked up several colors -- used some now and saved the others for Christmas. The Jack-o-lantern design on white shirts turned out great, but after they were finished, I worried they might be too 'sweet' for these rough and tumble boys. So I decided to stitch the Trick or Treat design on dark blue shirts. These would have been the perfect opportunity to use glow in the dark thread, but I didn't have any at the time. I used Inspira Aqua-Magic Plus Dissolvable Adhesive stabilizer in the hoop and Sulky Solvy as a topper for each of these projects. For the shirts, I also used a fusible wash-away stabilizer, ironed to the inside to keep the knit from shifting around. When the embroidery was finished, I put everything through a wash and dry cycle. All the stabilizers washed away fine, except for the fusible backing -- it didn't dissolve completely and little pieces of the fiber stuck to almost everything in the wash load. I'm not sure if the water temperature was too cool or if my HE washing machine didn't agitate enough, but the next time I use that fusible stuff, I'll be hand washing and removing it before it goes in the laundry with anything else. Fortunately, I was able to get the sticky fibers off of most of the the other items. And that's another good reason why I keep this blog - it helps me keep track of my trials and errors so I (hopefully) don't keep repeating them!